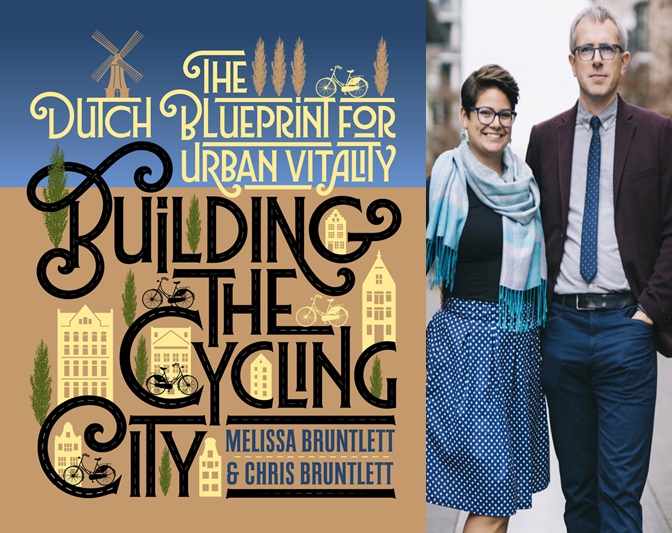 TransportiCA: Questions for October's Book Club Contest: "Building the Cycling City"
Questions for October's Book Club Contest: "Building the Cycling City"
For the October 2018 Book Club selection, TransportiCA has chosen Building the Cycling City: The Dutch Blueprint for Urban Vitality (Island Press), by Melissa and Chris Bruntlett. Using writing, photography, film, and the power of social media, the Bruntlett’s communicate a more-human image of multi-modal transportation; one in which greatly promotes the public health, environmental, and social benefits of walking, cycling, and public transit. Further, the couples’ goal is improving on the significant strides already made in many cities, while creating a more open and welcoming environment, for residents and visitors alike. 1) The Bruntlett's conscious decision to sell their family car occurred what year and season? 2) The Dutch have two words for people who ride bikes; what are they, and what are their ‘simple’ translations? 3) The Bruntlett's argue that "electric-assist bicycles," casually referred to as _________, are absolutely essential to make urban cycling a more broad, inviting, and inclusive activity. No purchase is necessary, as questions are not taken directly from the publication, but from respective technical information and publicity. To send in your response, submit via TransportiCA's "Contact Form" on the front-page (bottom left), sending your name, email address and answers. The deadline for submission is 23:59, Wednesday, 31 October 2018.